According to a recent survey done by AOL and The Today Show, women spend an average of 55 minutes each day on their hair and makeup. That’s approximately 335 hours or two full weeks every year. A look at various studies on the makeup habits of consumers indicates that anywhere from a third to half of the women surveyed never leave home without wearing some type of makeup. With makeup application being such a staple of so many women’s daily routine, it makes a lot of sense to have a dedicated space like a makeup table in order to streamline your daily beauty routine. Whether you call it a vanity, dressing table, makeup vanity, vanity table, cosmetics vanity, or cosmetics table, makeup tables have a lot of benefits. Having a posh makeup area where your beauty routine occurs almost every day is certainly practical, as it helps you to stay organized. It also allows you to have a personalized, comfortable space to complete your beauty ritual. Let’s look at some makeup table ideas that get a little more in-depth about how useful they can be, as well as some considerations to make before buying one. A 2015 Poshly and Stowaway Cosmetics survey of 4,000 U.S. women found that the average woman owned just under 40 makeup products, but only regularly used five of them. 75% of those surveyed said they routinely never finish their makeup products. With a plethora of cosmetic types and brands to choose from, keeping all of your beauty essentials and self-care products organized can be a challenge. Having a dedicated space that’s set up to handle all of your makeup storage needs with an ample countertop, drawers with dividers, and cabinet storage will make a big difference in keeping your daily prep area well-organized. Having a dedicated and well-designed makeup application and removal space where everything is in one place and within easy reach will facilitate a consistent, efficient daily beauty routine. That saves you time and minimizes the aggravation that comes with searching for items you can’t find. Some elaborate makeup applications require a very precise touch and take more time, so the last thing you want to feel is rushed, scattered, and uncomfortable when applying your cosmetics. And while some women are perfectly fine standing when applying their makeup or styling their hair, a lot of women find it easier and more efficient to sit down for these tasks. You can have your makeup station designed just the way you prefer for maximum comfort. That includes choosing a comfy seat, having your countertop set at your preferred height, and picking the perfect task lighting and mirror for your makeup area. You could save a few bucks and buy a build-it-yourself makeup vanity online or from a big box store. But if you want to add a makeup space with an elegant, high-end look that’s durable, well-built, and with more design options, a bespoke makeup table is the best choice. You’ll have much more freedom to fully personalize your makeup table when working with a custom cabinet designer and manufacturer like Organized Interiors. By having direct input into the furniture’s design and the ability to have a dialogue with the cabinet maker after everything is installed, you’re assured of complete satisfaction with your product. Makeup tables are well-suited to several home spaces, which gives you some flexibility when it comes to choosing a location. You don’t need a lot of space for a makeup table either, which gives you additional freedom when choosing a spot. 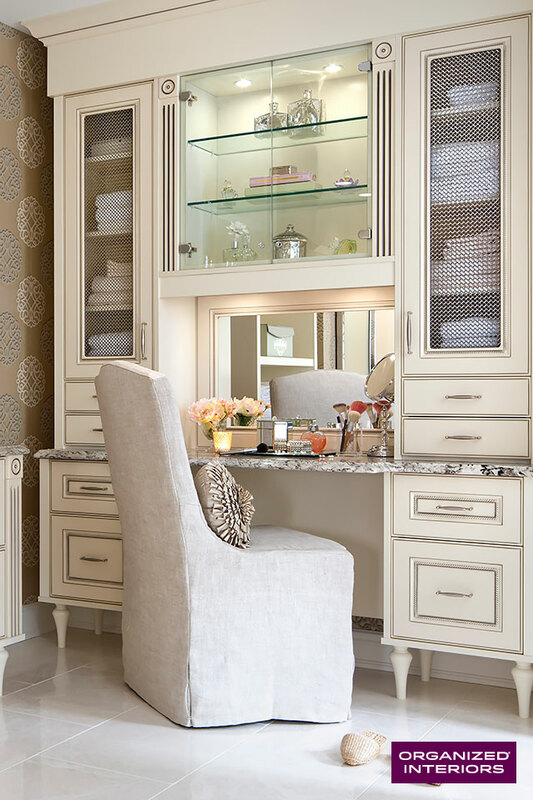 If your available space allows for it, “going big” with your makeup table design is certainly an option, too. We’ve established that there are several practical reasons to get a makeup table. But if you’re looking for an additional reason to make such an investment, how about because it’s simply nice to pamper yourself once in awhile? If you invest a lot of time and care into your daily beauty routine, a custom self-care space is the perfect way to treat yourself to something special that improves the quality of your “me time”. Adding a makeup table also allows you to inject your décor with a luxurious aesthetic that improves the feel of your environment. That can help make your daily beauty routine feel less tedious. Organized Interiors’ talented design consultants can take your makeup table ideas and bring them to life with creative and stylish bespoke designs. Schedule a complimentary in-home design consultation with us to get a free quote and some expert advice and guidance on how to create your own unique makeup preparation space.